On the Opal Coast (Côte d'Opale), Calais is a major port with a large passenger business between France and Great Britain. It is also a historical town with beautiful ancient monuments. The lace workshops are renowned. At the seaside you will find a long sandy beach popular with families. It is lined by typical wooden chalets. 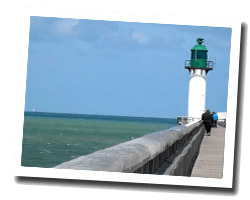 In Calais, enjoy a seaview holiday rental. Studio Apartment in the "La Matelote residence". Distance to the sea: 20 m. distance from town centre: 50 m. View of the port. 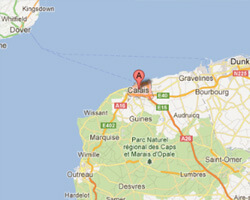 Appartement Violette is a self-catering accommodation located in Calais. It offers a balcony with outdoor furniture and sea views. It is only 550 m from the beach. Studio magnificent sea views 3rd floor with elevator, balcony and direct access to the beach and the sea. Beautiful bright studio 30m² on the 1st floor ( with elevator) of a secure residence with caretaker and intercom. Price from 300 € to 450 €.